Good visibility for bus drivers to see people waiting (and for those waiting to see buses coming). Lighting at night for security (and possibly an emergency call box). Maps of area near bus stop. 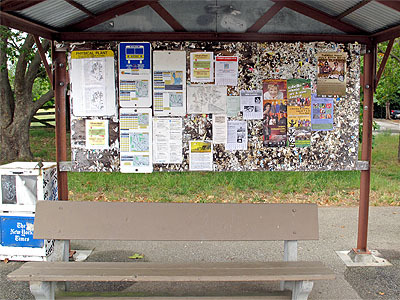 Ample bulletin board space for community announcements. Attractive appearance suitable for neighborhood. 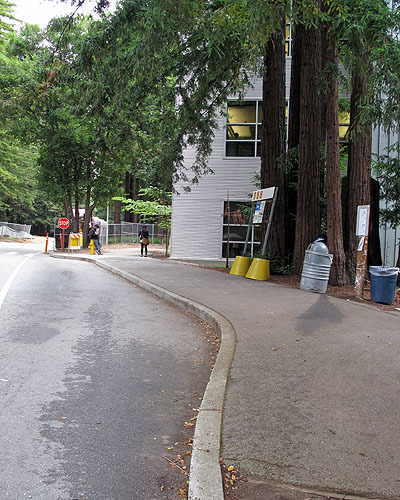 When I first started work on campus, we had great little redwood bus stop shelters at every bus stop, but they started to rot and were all torn down. 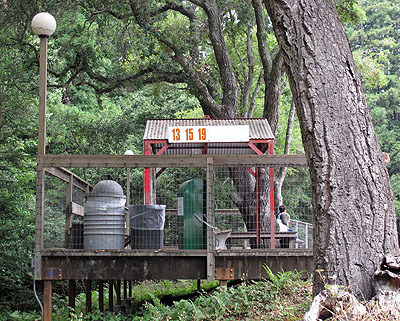 The old shelters had all the desirable features except one: they lacked campus maps. The administrators promised us great new shelters after tearing down the old ones, but “temporarily” got some cheap sheet-metal roofs with no wind shelter and little or no poster space. Typical prefab bus shelter on campus—this one is deep in the East Remote Parking lot. One new bus shelter was built (at the main parking lot, of course, since motorists are far more important than people who take the bus to campus). It was bigger and better looking than the prefabs, but still had no wind shelter and only minimal bulletin-board space. This used up the bus shelter budget, and subsequently only the prefab units were used. 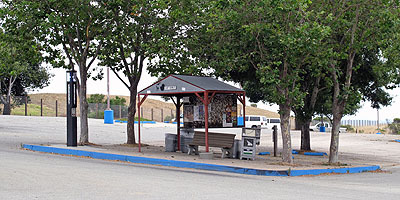 Large bus shelter at the East Remote Parking Lot, the only custom bus shelter on campus. College 9 bus stop that causes serious pedestrian congestion. The Health Services bus stop doesn't get a shelter or a widened sidewalk, but does have benches. The only amenity for the Science Hill bus stop is a trash can. Even the signage is temporary. There is one bus shelter on campus where widening was done to put in the bus stop, when the campus decided to have the buses go both ways around campus, rather than always counterclockwise (more on that decision in some later post). 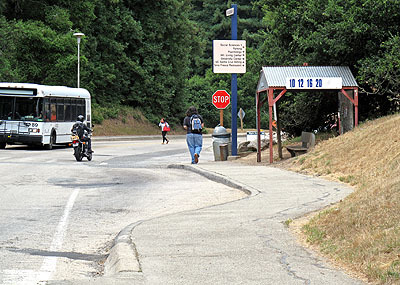 Bus stop on a deck—the only place widening was done to make room for a bus shelter. Overall, the bus stops on campus are dismal designs, failing on all design points except rain shelter, posted bus schedules, and lighting. 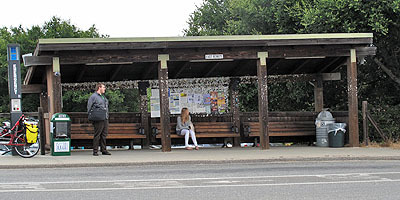 Several of the bus stops manage only the bus schedules and the lighting. I’d be amazed if those shelters get replaced before they fall down. The “temporary” buildings at my elementary school are still there 40 years later. Indeed it has been something like 15 years since the “temporary” shelters were started. Now they no longer pretend the shelters are temporary or that they will ever put in proper bus shelters. As long as they can buy prefab units at the farm store that meet 2 or 3 of the 10 criteria, why should they bother? It’s not as if those of us who ride the bus were real people, after all.